The Cure for Boils Potion is the very first potion that freshman students will learn in year one, chapter two, from potion master Professor Severus Snape. A little heads up, although it's your first potion it won't go easy for you. 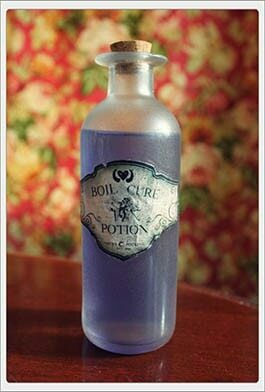 The Cure for Boils is just a simple potion that cures boils. This potion doesn't have some important role in the Harry Potter: Hogwarts Mystery mobile game. This potion is easy to brew. Because of that, professors use this potion to teach new students in Hogwarts School of Witchcraft and Wizardry. In order to learn your first potion, you will need to earn two stars, as seen in the picture above. To earn a star you will need to do a series of tasks. Those tasks will just be a series of clicking on shiny objects or students. For you to finish those tasks you will need to spend energy. You have a limited amount of time to finish every lesson so be careful on how much energy you have before starting the lesson. First, you will need to watch Professor Snape's demonstration on how to brew this potion. Afterward, all that is left is for you is to try and brew your first potion. You will also need to spend energy on stuff like gathering supplies and learning a few more tips from books. When you completed all the tasks, and when all of your ingredients are in the cauldron, you will be given the motion path to finish making your first Cure for Boils Potion. Upon learning to brew Cure for Boils Potion you will earn +5 Gems that you can spend on many in-game features like clothes or accessories.